Metal Motion Art had humble beginnings. It started with a sheet of copper left over from a water feature — an arched bridge over a pond — I built for my home in Brainerd, MN, in the heart of Minnesota lake country. I re-discovered that abandoned piece of copper, now gathering dust in my new garage following a move to the western suburbs of Minneapolis. Memories of the creativity and engineering that went into the water feature came flooding back. So did memories of the lake. I really missed all of it! So … I cleaned off the copper, grabbed some basic metalsmith tools, and, in a few hours, shaped it into a free-standing leaf. Next it needed detail … and then a finish … then a base. I was hooked. You can see that first leaf sculpture in the photo above. It’s small, sitting on the work surface below the loon wall art. Fast forward a few years and many sculptures later. 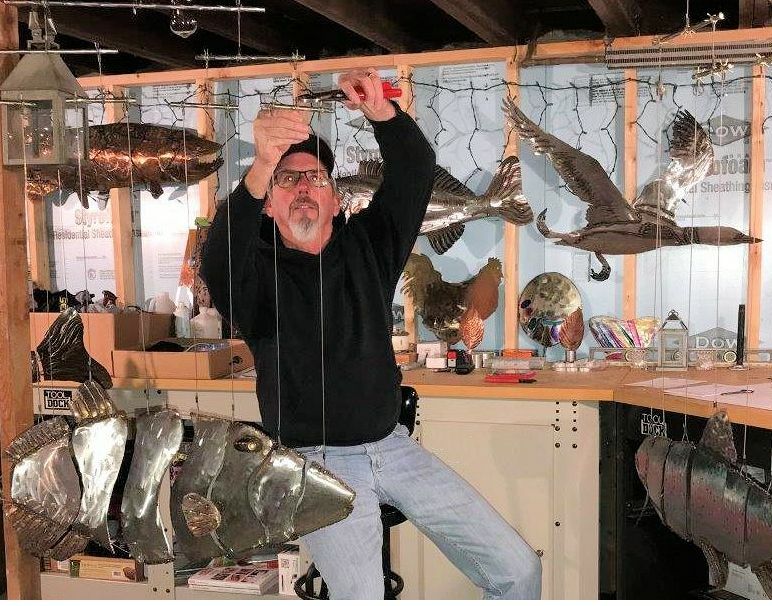 Now the sculptures move and hang and swim with the wind, and they range in size from 12” to 72.” Today, I have a sizable studio with space for designing, building and rigging, and state-of-the art equipment that allows for meticulous attention to detail. My love for marine life infuses all aspects of my sculpture — from fish to fowl to more fanciful mermaids. I fell in love with oceans and lakes growing up as a Navy kid on bases in Maine, Florida, Texas, Virginia and Spain. My metalsmith skills were also honed early as I observed my Dad, a Navy pilot, build his own private aircraft from aluminum. Metal Motion Art is growing. I am attending more art shows, accepting commissions and seeking galleries to represent my work. Stop by and see my work at Ironbound Gallery in Camden, Maine, if you happen to be in the area.